What’s a TPO roof? A TPO, Thermoplastic Polyolefin, roof is a thin rubber like single ply roofing material for low-slope roofs. It’s been used on commercial and industrial roofs for quite a while now. It’s a great alternative to PVC, EPDM & Tar and Gravel or Built-Up Roof (BUR). TPO roofs usually come in white, grey, and tan. They do have other colors. However, white, grey, and tan are the most used colors. Can a white TPO roof actually be green? How will it benefit your flat roof? We’re glad you asked. How in the world can a white TPO roof be green rather than white? The benefits can be to both your building and the environment in money savings and being more environmental friendly. Probably one of the biggest benefits of installing a white TPO roof is the cooling costs of your building. Since it’s white, it will reflect heat rather than absorb it which, in turn, will reduce your cooling costs. White TPO will also reflect the suns UV rays rather than absorbing them making the roof more UV resistant which also makes your roof, potentially, last longer saving you money in repair and replacement costs. It stays flexible throughout it’s lifespan. Furthermore, that same flexibility allows for building movement which will reduce ripping or tearing. It meets and/or exceeds the U.S. Environmental Protection Agency’s (EPA) ENERGY STAR specifications. It’s 100% recyclable. Most other roofing systems are not! It’s chemical resistant. Think HVAC systems and such on the roof that have chemicals in/on them. From an aesthetic point of view, since it’s a smooth installation it stays clean looking longer. We have to deviate just a bit. Regardless of color chosen (white, grey or tan), TPO roofs are considered seamless since the bond is so strong. It can be bonded in 1 of 3 ways: mechanically attached, full adhered/heat welded or ballasted to the base surface of the roof itself. That not only makes stronger seams, but it also makes for a stronger roofing material that resists tearing, cutting and penetration. Since it’s considered seamless it’s also highly resistant to wind damage and offers better leak protection. 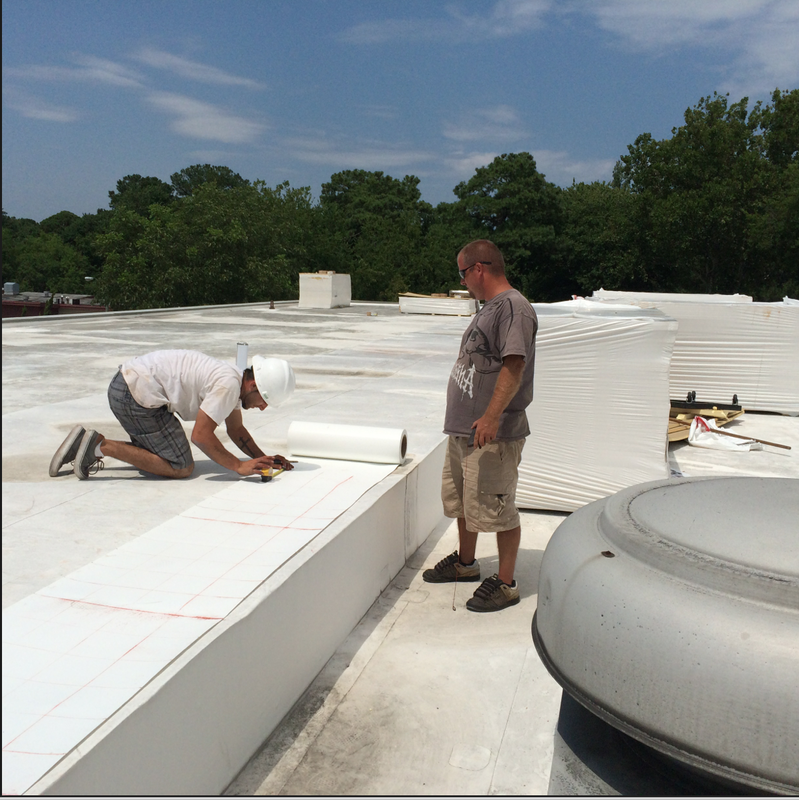 Flat Roofs by Pegram has extensive knowledge in the installation and repair, if needed, of TPO roofs, including white. Please email us or call us, (757) 537-1945, for more information. Some commercial and residential roofs use Tar & Gravel or Built-Up Roof (BUR) as a roofing solution. Let’s look at both solutions. Both solutions work on a little to no slope type of roof. First let’s define what a Tar & Gravel or Built-Up Roof (BUR) is. It’s made up of 3 to 5 laminated layers, hot tar and roofing felt. It also has a layer of bitumen and an aggregate top layer. It’s been used for well over 100 years. It works, but there are some disadvantages which we’ll get into shortly. What’s a TPO roof? As we’ve mentioned in other posts, a TPO, Thermoplastic Polyolefin, roof is a thin rubber like single ply roofing material for low-slope roofs. It’s been used on commercial and industrial roofs since the late 1980s in both the US & Europe. It was initially used in pond liners and the auto industry. It is an alternative solution to other roofing materials such as PVC, EPDM & others and usually cheaper. So what gives? I have a flat roof what should I choose for a roofing solution: TPO or Tar & Gravel? Let’s looks at the advantages and disadvantage of both. Both TPO & Tar & Gravel can be about the same price depending on the installer and product used. However, that’s just about the only point where they are the same. Often times you will find that TPO is actually cheaper with many advantages whereas Tar & Gravel has more disadvantages. When it comes to environmental questions both help with UV light in that it will reflect or absorb the UV light for roof longevity. However, TPO is cooler in the summer and warmer in the winter due to TPO reflecting and absorbing heat depending on the color used since TPO can be white, black or gray. What are other environmental considerations? A Tar & Gravel roof with tar, felt and fiberglass isn’t recyclable at all. Whereas, A TPO roof is 100% recyclable. As anyone that has ever been around tar knows, it smells. It’s bad for the installers as well as the people around it when it’s being installed. Granted it’s a short-lived inconvenience for the building owner, not so much for the installers. They deal with it frequently. A TPO roof doesn’t have that smell, is safe for the installers and is energy star rated. A Tar & Gravel roof is not due to inconsistencies in depth. More on that later. What about installation? A Tar & Gravel roof can take longer to install than a TPO roof as it has to be “created” on site. Remember the smell we mentioned earlier? A Tar & Gravel roof, since it’s “created” on site doesn’t have a consistent thickness. You will have some areas that are thinner than other areas. Whereas a TPO roof is manufactured so thickness is consistent across the roof. Both Tar & Gravel and TPO use heat to install but in VERY different ways. Tar & Gravel, as mentioned above, has multiple layers which involves heated layers. Did we mention the smell? Whereas TPO uses heat to “heat weld” the seams. One final point worth mentioning. Depending on the thickness of the Tar & Gravel roof your roof may need to be reinforced to accommodate the additional weight vs. a TPO roof which is no issue with regard to weight. Let’s consider if something goes wrong. Both roofing solutions can be walked on. Both are waterproof depending on how well the installer does the install. But what if a leak happens? Leaks in a Tar & Gravel roof can be very difficult to find. Think about it from this perspective. Try finding a water path when pouring water through rocks in a garden. It’s not easy. It goes all over the place. That’s how a Tar & Gravel roof is since it has aggregate. That’s not to state that a leak can’t be found, but it’s not as easy as TPO and could be more challenging to repair. Whereas a TPO roof leak can be found and sealed using different techniques. It’s similar to finding and sealing your favorite pool float or inner-tube. You find it, patch it and walk away knowing that it’s truly found and sealed. Final thoughts. We most certainly advise customer to use TPO instead of a Tar & Gravel roof based on what we’ve mentioned above. It’s cheaper, more environmentally friendly and, generally, easier to repair should something happen. IN case you didn’t see our post on “Why TPO is the best choice for commercial & industrial roofing” here’s what TPO is. First and foremost, compared to other roofing materials such as rubber, PVC & EPDM, TPO is usually cheaper with similar longevity. With regard to longevity, it’s worth stating that TPO has only been out for a while; shorter than PVC & EPDM. So the longevity isn’t known compared to PVC & EPDM. However, everything is showing that it has good longevity especially when installed by an experienced professional. TPO is more environmentally friendly. It’s UV resistant and heat-resistant like EPDM. It’s also the greenest, environmentally friendly single-ply roof material available. It contains no chlorine, even the welding process has no chlorine in it. Finally, it’s 100% recyclable. Heat-weldable like PVC for flexibility of use. AND because you can weld it, it can also be repaired if something happens. The welded seems are stronger than EPDM. Depending on what you read, the welded seams of TPO can be 3-4 times stronger than EPDM. Though the choice of colors are limited you still choices: white, light grey and black. TPO resists: mold growth, dirt accumulation, tears and punctures. It also resists those same tears and punctures due to a building’s movement or settling as well as thermal expansion due to environmental conditions such as heat and cold. TPO is easier to install and with less seams. Resistant to chemicals (think air-conditioning coolants & lubricants), acid, salt, oil, airborne bacteria, etc. TPO roofs are easy to install, but we most certainly we recommend someone that has been trained and has experience such as Flat Roofs by Pegram.